Swarm Blog: Want to be a Millionaire? Know Flags? Get This! Millionaire - Flags Edition, a new Android game by developer Amrinder Binepal, offers similar game play to Who Wants To Be A Millionaire. Players must guess which country the flag displayed belongs to in order to continue playing. Guess incorrectly, and the game is over & the score is submitted to a global leaderboard. The online global leaderboards (powered by Swarm) nicely enhance the worldly theme that is already present in a flags quiz game. No matter which country you're from, you can represent your heritage and compete for the number one slot! 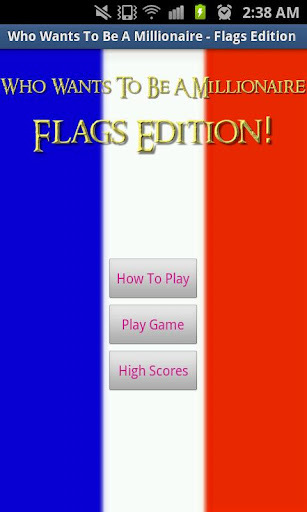 With over 150 different flags, this game will probably keep you entertained for quite a while. See how you stack up against your friends and the world! Download Millionaire - Flags Edition from Google Play today and see if you can become number one.